In this post I’m going to tell you about a Facebook Ads Course that has helped me to book more photography work than I ever thought possible. 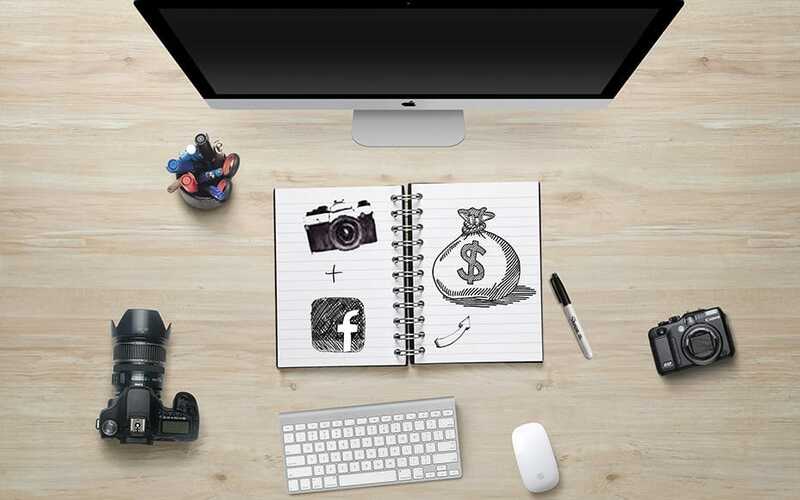 By spending just a few dollars on a one-off Facebook ads campaign and following the exact steps outlined in this course, I believe that any photographer can quickly accelerate bookings and boost earnings. ‘How to Run a Facebook Ad Promotion for more Photography Leads, Shoots and Sales’ is a rather long-winded name for an incredibly effective Facebook Ads Course designed by Andrew Hellmich. 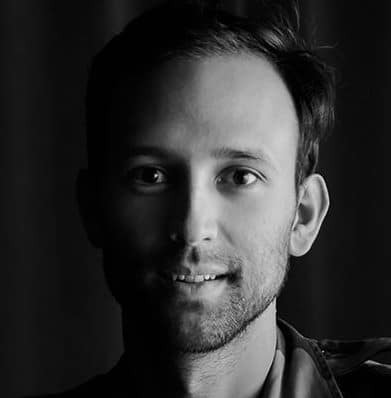 Andrew is a wedding and portrait photographer who also runs the excellent PhotoBizXposed podcast, interviewing fellow photographers and industry professionals who offer helpful advice and share their stories of success. I’ve been a long time fan of PhotoBizXposed, and was flattered to be interviewed by Andrew in a previous episode here. Another interviewee, a business expert named Bernie Griffiths, shared the basics behind a Facebook ads technique he’d devised to accelerate photography bookings and sales. Following that interview, numerous podcast listeners in the PhotoBizXposed Premium Members Group started replicating Bernie’s techniques, with astounding success in their photography businesses. 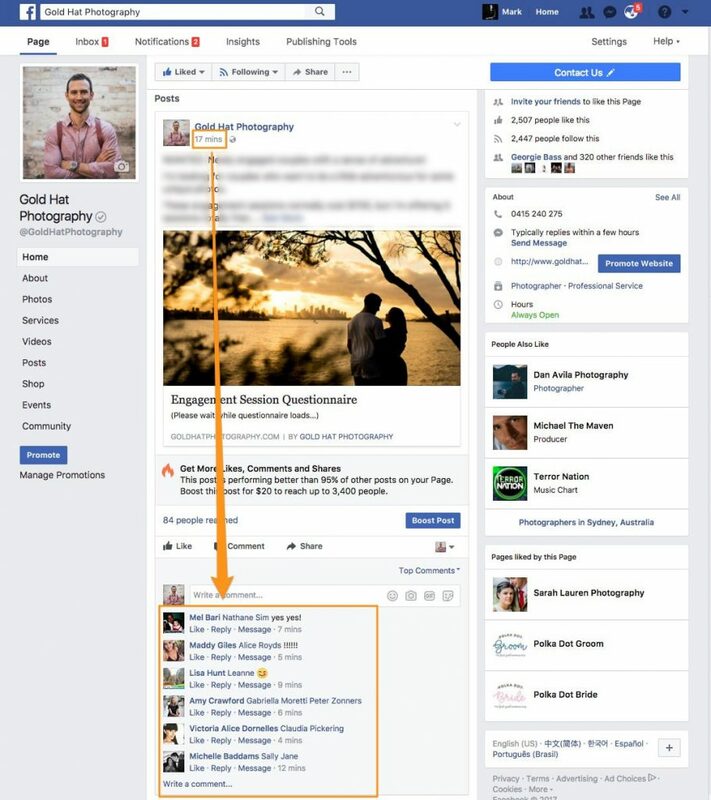 As a result of so many other photographers sharing their successes (as well as some minor failures), Andrew was able refine the original process and create an absolutely fool-proof Facebook ads course. The ‘How to Run a Facebook Ad Promotion for more Photography Leads, Shoots and Sales’ Facebook ads course is the culmination of a project that has been crowd-tested to perfection. Click here to have the $20 discount applied automatically! The Facebook ads course is presented on a mini-website, with over 24,000 words laid out over 19 lessons, including explanatory videos, audio case studies and an ever-expanding Q&A section. The beauty of the course being on a mini-website rather than on a static PDF is that it can be updated easily by Andrew, who frequently adds helpful content to the Q&A section or shares the success stories of the course’s students. To say there’s a lot of helpful content in the course is an understated – there’s absolutely tons of value here, but that’s not to say the process is complicated. Far from it, actually. 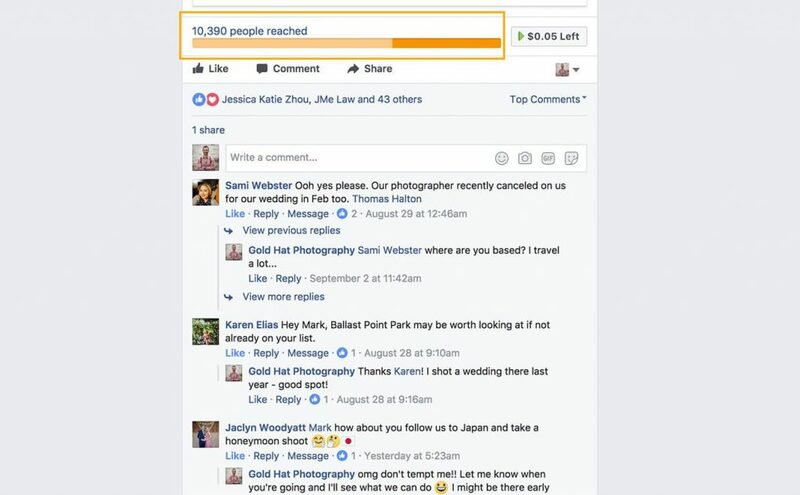 I wanted to provide a full review of ‘’How to Run a Facebook Ad Promotion for more Photography Leads, Shoots and Sales’, and to do so, I knew I had to implement the entire strategy on my own wedding photography business page, and document the results firsthand. SPOILER ALERT: The results blew me away. 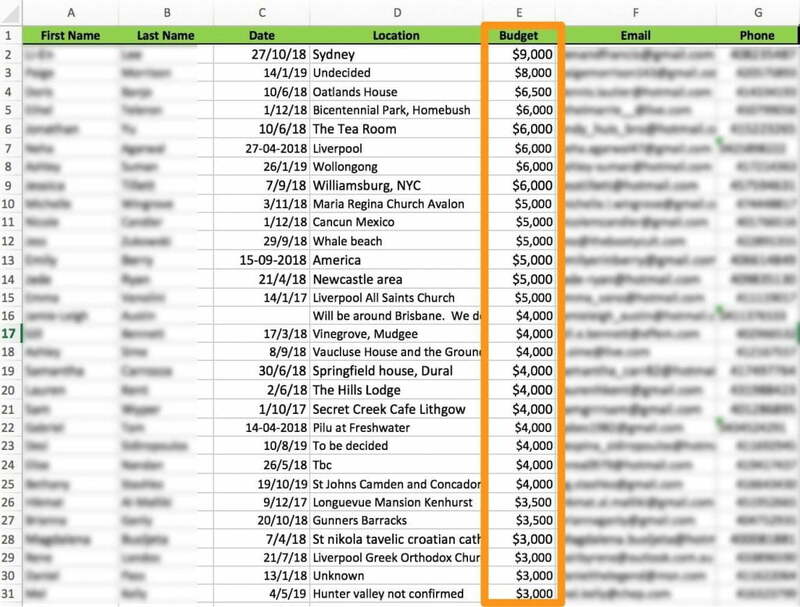 Imagine paying less than $0.12 per new wedding or portrait client email, details on the location of their wedding… and even their budget!! Imagine paying less than $20 for a list of this kind of information on clients who want to be photographed by you! So one afternoon, I set the stopwatch and started reading the course, implementing everything that was laid out in front of me. One of the keys to your success using this Facebook ads course is that you must adhere exactly to each step. Since every variable has already been tested by so many other photographers in the same shoes as you, there’s no need to change anything. I have followed Andrew’s instructions to the letter and in 24 hours I have 24 completed questionnaires, 2 wedding inquiries and the ad has been seen by 4000 people. This stuff is gold. All for £20, and I have 6 days left to run. I was literally just copying and pasting the exact content that was provided for me in the course. All I needed to add were my own photos and brand name. So far so good – I’d followed each step to the T and created a Facebook ad campaign which mimicked the one in the course, all in less than one hour. I’d set a modest budget of $20 for my Facebook ad, and followed the exact audience targeting guidelines as instructed. The 19 lessons of the Facebook Ads Course – clicking each title expands the lesson content for you to follow. For those of you who’ve never used the Facebook Advertising Platform before, it’s an incredibly powerful (albeit slightly complicated) way to laser-target people with your chosen ad. I use Facebook ads to book destination weddings, and have written about them extensively in More Brides. However, even if you have zero experience with Facebook ads, all you need to do is to follow the instructions in Andrew’s course… which is exactly what I did. So, with my ad set up to run for 10 days with a very affordable ad budget, I nervously waited for Facebook to make the ad live on my photography business page. The quickest way to create a Facebook ad is actually by creating a post organically (i.e. just posting something on your page), then creating the ad around it (i.e. paying for it to be shown to more people). Most Facebook business page owners don’t want to spend any money trying to extend their post’s reach, but unfortunately, this severely limits the number of Facebook users who see their post. The heyday of Facebook organic reach is over, where each post made to a business page in 2017 will only reach between 1-6% of its followers. 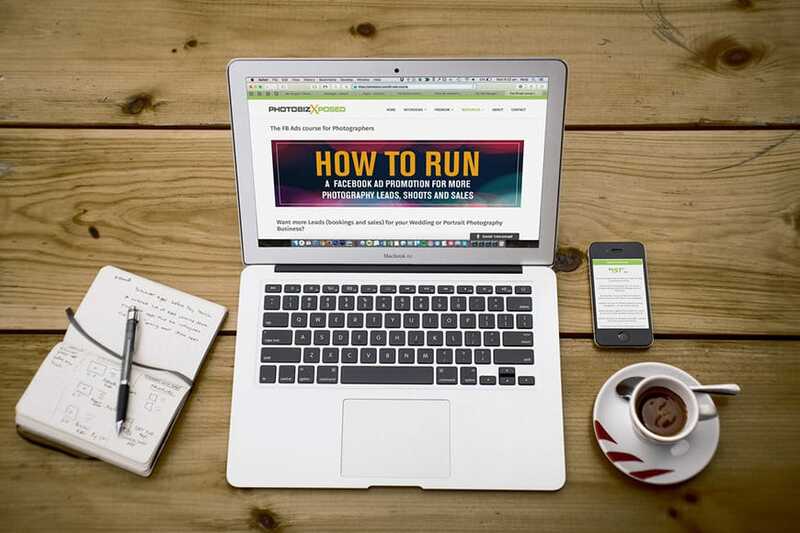 When running through the steps in the ‘How to Run a Facebook Ad Promotion for more Photography Leads, Shoots and Sales’ course, Andrew advises you to create an organic (unpaid) post on your Page first, then turn it into an ad. I’d never done this before, so was interested to see what would happen. I was convinced that even though I was using the exact text copied from the course in my post, the real ‘magic’ would come after I’d turned it into an ad. I’ve obscured the actual text in the post since it’s a part of the course. 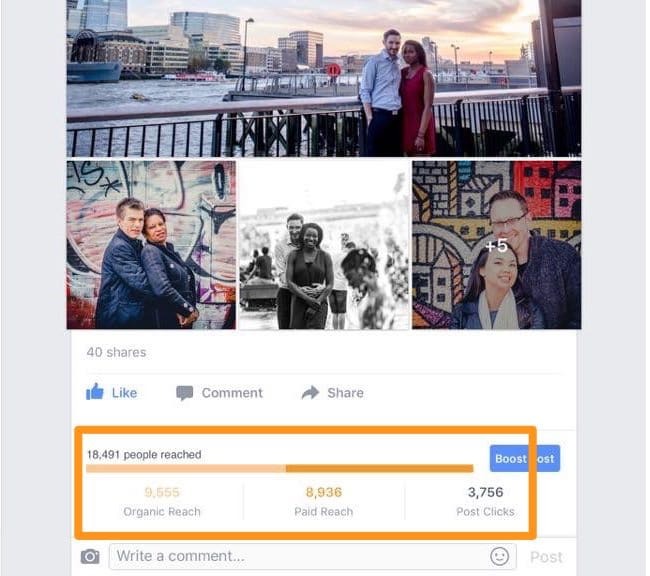 I literally couldn’t believe what I was seeing – people were commenting and more importantly, tagging their friends on my organic Facebook post! As the organic engagement on my post grew, its reach continued to climb and climb, and I hadn’t even spent any money yet! I even considered not doing the paid ad, as I’d already had an amazing response… for free! The techniques described in this Facebook Ads Course are very simple, but also incredibly powerful. I discovered that even without any ad budget whatsoever, I could still get way more wedding and portrait leads for my business than I could have ever imagined. Hey so I ran my first ad today. I’ve only spent $4 and my inbox is going crazy! 2 hours after I’d posted to my Facebook page and having not spent a penny, the results continued to blow me away. I had over 30 comments, each one tagging one or more names which were outside of my Facebook page fan base. The ‘engagement’ and ‘reach’ of my post was going through the roof! For the interests of the review, and to adhere strictly to the exact course outline, I continued with my $20 ad spend, and below are the results after a few days – make sure you click the image to see the full extent of the post’s reach! Click the image to see the full extent of this post’s reach and engagement on Facebook. In summary, after 5 days and just over $20 spent, my post generated over 80 comments, over 100 tags, 30 new page Likes and a Reach of over 10,400 people! 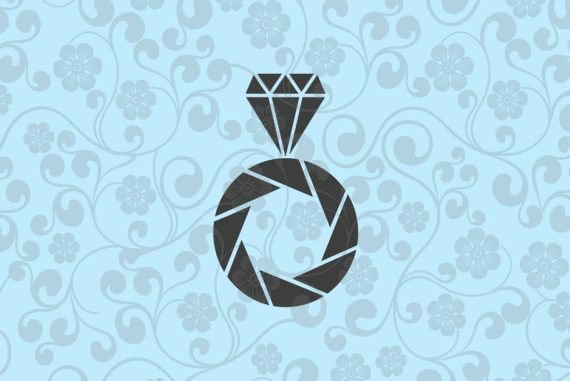 If you consider that on average, a Google AdWords campaign for wedding photography in a competitive market will cost around $1 per click (and that click may not even go on to convert into a lead! ), 10 cents per qualified lead (i.e. someone who’s already interested in what you’re offering) is absolutely incredible. The highlighted sections show post engagement, reach and cost per result (i.e. someone filling in the questionnaire on my website and leaving their contact details). The entire technique is actually very simple – literally any photographer with a Facebook Page who can follow steps can sky-rocket their bookings. The bottom line is, if you want to make more money as a photographer in the fastest way possible, you need to buy this course! I’ve added another screenshot below from the results of one photographer who ran the course with an ad budget of just $50, and a quote from him regarding the success of the ad. Delighted to say I’ve just gone and booked a ‘destination’ wedding in Finland next year, off of one of my first FB Ad Course engagement shoots this weekend. There are so many screenshots and testimonials like this in the PhotobizXposed premium members group from other photographers who had similarly incredible results, all confirming just how effective this ads course is. As for the price, at $197, I consider it an absolute bargain, and so do all the other photographers who’ve made the investment (read their testimonials here). Sure, $197 is a lot of money, but it’ll pay for itself 10 or even 20x over very quickly indeed. By following the steps in this Facebook Ads Course, I’ve been able to book more portrait and wedding shoots than I know what to do with. If you have associate photographers to whom you can pass the excess work, you’re really going to make a killing! If you’re fed up of all the vague ‘marketing experts’ out there who speak a lot but don’t really tell you anything useful, this is the course for you. The entire process is immediately actionable, meaning that you just copy the steps and execute. I love guides like this, as it means I don’t have to think! Good article. Thanks for sharing Mark! Great article Mark, thanks for posting! I’ve tried a few FB campaigns after listening to Bernie Griffith’s interview on Photobizx, and although I’ve attracted a lot of interest for the free engagement session (one campaign I ran for a week had over 100 entries), I can never quite work out how to convert the couple into paying wedding clients (I’m not interested in selling prints from the engagement session, by the way). Is this covered in Andrew’s guide, out of interest? Hey Dan, I know exactly what you mean! I’m going to loop Andrew into this to answer your comment better than I can. Hold on a couple of days! In regards to ads and converting engaged couples to wedding clients – I don’t think there’s a real strategy to do this and it needs to be treated more like a “no brainer” for the couple to book you for their wedding after they have experienced what you do. In saying that, if you’re getting a great response to your ads, it starts with your questionnaire and making sure you’re only photographing couples who have a wedding booked on a date you have free and don’t have a photographer booked yet. You can ask additional questions to give you some idea if they are a good fit for you and are looking to spend what you charge. FOr example, where they are planning to have their wedding, what they do for jobs, wedding budget, etc. I would only add these questions if you are getting a good response to your ad, booking shoots but finding you’re attracting the wrong kind of couple for your business. Also, the phone calls are critical – that’s your chance to really learn if the couple are a good fit for you. I go into detail on this in the course with role play audio of what to say and how to turn couples away – nicely. Remember, you only want to be photographing couples suitable for you. From here, once you’ve booked the shoot, it’s a matter of you delivering the best experience possible. In my experience, once the couples have had fun on the shoot, seen their photos and have had a great time through the process, that naturally want to book me. I’ve become the photographer they know, like and trust. To “close the deal, ” Tenneille, my studio assistant, who does the sales sessions with the couples asks about their wedding, if they want a pricelist and she promotes me as a photographer. There’s no hard sell and couples usually call in the following week to book me as their wedding photographer. Hope this helps but ask away if you need clarification on anything. How do you deal with labor laws in countries such as the EU or Canada which make it difficult for foreign photographers to work there? Can you use this for commercial and headshot photography? Yep, definitely. 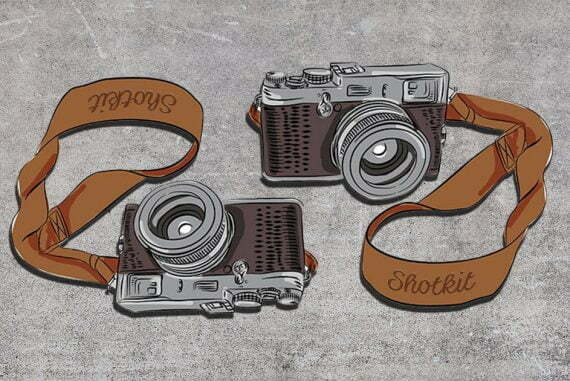 Any type of photography that involves people and payments!